The persistent softness in the IBM’s (IBM) top-line performance worsened in the third quarter when revenues dropped and missed analysts’ estimate by a huge margin. The IT giant’s stock lost about 4% in the selloff that followed the announcement on Tuesday. Earnings, on the other hand, came in above expectations. During the third quarter, adjusted operating earnings rose 5% annually to $3.42 per share, far exceeding expectations. Unadjusted earnings, meanwhile, edged down to $2.69 billion or $2.95 per share from $2.73 billion or $2.93 per share last year. The Big Blue reported revenues of $18.76 billion for the September quarter, down 2% from the year-ago quarter and far below Wall Street estimates. Contributing significantly to the decline, revenues of Cognitive Solutions, which covers solutions software and transaction processing software, fell 6%. 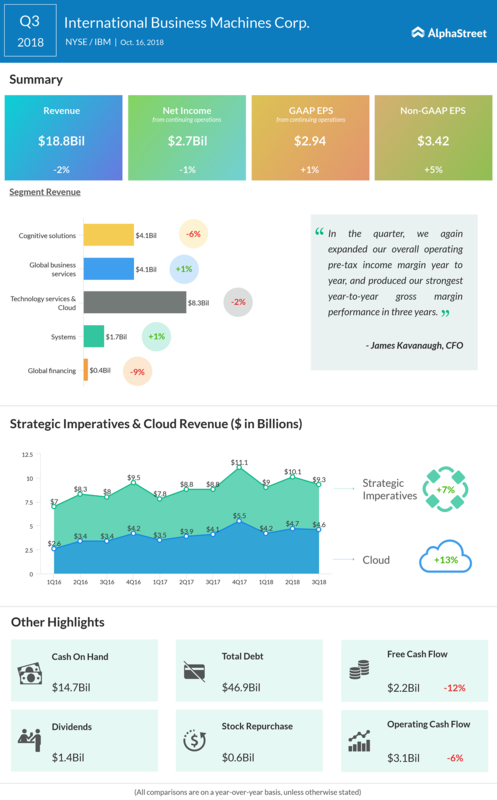 Technology Services and Cloud Platforms revenue dropped 2%, reflecting the absence of new cloud deals during the quarter. Meanwhile, Global Business Services revenues edged up 1%. In the preceding three quarters, IBM had reported positive revenue growth, ending a declining streak that lasted for about five years. “In the quarter, we again expanded our overall operating pre-tax income margin year to year and produced our strongest year-to-year gross margin performance in three years. At the same time, with our strong cash generation, we increased our capital investment in the business through the first three quarters and continued to return capital to shareholders,” said CFO James Kavanaugh. For the whole of 2018, the management forecasts adjusted operating profit of $13.80 per share and unadjusted earnings of $11.60 per share. Full-year free cash flow is estimated to be around $12 billion. IBM’s stock, which has been a laggard for quite some time, dropped about 9% since the beginning of the year. The stock closed Tuesday’s regular session up 2.5%, but fell sharply in the after-hours following the earnings report. On the other hand, rivals Microsoft (MSFT) Amazon (AMZN) made significant gains during the year-to-date period.